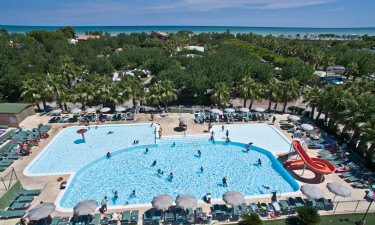 Families who want to spend time in the water while exploring the mountains of Italy are sure to be impressed by the huge water park at Don Antonio. 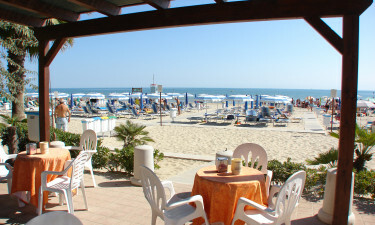 The campsite also offers guests easy access to the enchanting Abruzzo region of Italy. The Abruzzo region of Italy is famous for its gently rolling hills and guests at Don Antonio will be greeted each morning by stunning views. while hiking and cycling trips are just waiting to be enjoyed, fitness classes, as well as a large number of sporting activities, can be enjoyed right on the site. Why choose Camping Don Antonio? Children of all ages are sure to find that playing in the onsite water park in the highlight of their camping holiday. In addition to playing on the huge water castle and water slides, the little ones can take part in a wide range of activities that are organised by staff at the Lillo Miniclub. The large restaurant at Don Antonio is the perfect place to sample traditional Italian meals and treats such as ice cream. Guests will also be able to create meals and light bites in their mobile home with fresh produce purchased at the onsite shop. Book your stay here with LuxCamp and get ready for your dream holiday.